For awhile now, I’ve wanted to start doing teen interviews. I’ve had the urge to do this for a couple reasons. The first is that I’m fortunate enough to know some very amazing teens and they always astound me. The more I learn about them–the more I want to learn. In fact, I’m usually so impressed, I want to share them with the rest of the world. There is a second reason I decided to do this kind of an interview–I write for teens and I’m friends with a whole bunch of folks who do the same thing. *grin* I know for a fact that they’re always looking for ways to get into the heads of young adults. As YA writers, we always want to know teenagers as readers, but we also want to dissect them and use their parts in our writing. I mean this in a completely non-bloody, kinda nice way. Alright Rebecca–tell us a little bit about yourself. I’m Becky, a college freshman. I love writing on typewriters, but will settle for candy wrappers if need be. I write a perzine called Evil Flower and when I write fiction it’s mostly about this child named Dee who refuses to leave my brain. my one sided love affair with a cat and more. I’m going to tell you a secret. When I was in college all I had was a typer writer. *gasp* If you wanted to use a computer you had to go all the way to the computer lab and wait for an empty slot to open up. So, can you tell us a little bit about what a zine is and how you started writing one? I have a really hard time pinning down what exactly a zine is, so I’m turning to the experts. According to the Barnard Zine Library, “short for magazine or fanzine, a zine is a self-publication, motivated by a desire for self-expression, not for profit.” Being the YA lit fanatic that I am, it is fitting that I came across zines in the book Hard Love by Ellen Wittlinger. Marisol–one of the first girl characters I had a crush on–wrote these amazing things in her zine and I knew I wanted to make one. 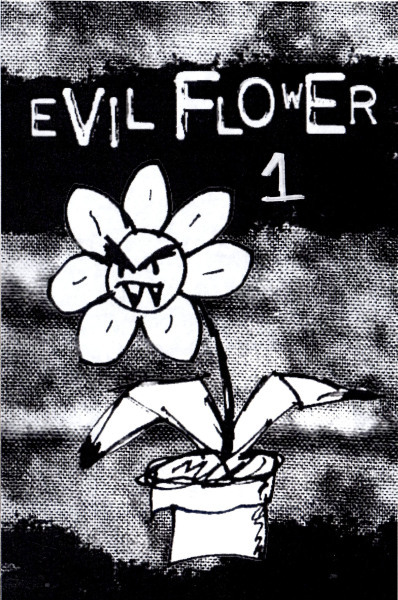 It wasn’t until a few years later that I actually sat down and made Evil Flower. 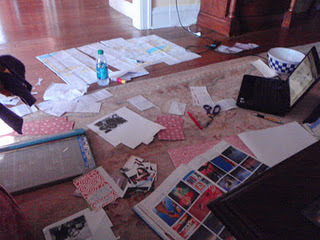 This is what happens to my living room when I lay out a zine. My parents at this point accept that I monopolize the floor for a little while every few months. I love that book and Ellen is a sweetie. That’s exactly where I learned about zines LOL! Too funny. So, what do you like to write about in Evil Flower? And how have your readers responded to it? 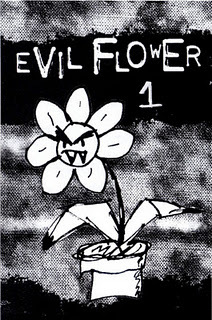 Evil Flower is what is a “personal zine” or a perzine. I often write about my struggles with depression and an autoimmune disease, but people often respond to the less grand pieces in the zine. The piece I got the most feedback on was a single page about about what I wish for when I make paper cranes. People really liked it but also told me that my handwriting was horrible! Zines allow a really open forum for feedback and constructive criticism and my zines have improved with each issue because of it. 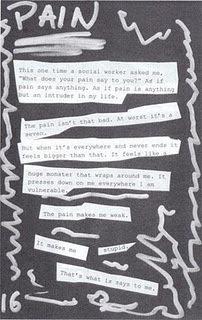 Evil Flower #2 is a perzine with pieces about apathy, pain, my crane wishes and more. I’m really glad you’re using your writing to help with your depression and an autoimmune disease. That has to be really tough. I’m sorry you’re going through such a hard time. In the not so recent past, there was a trending thread on twitter called YASaves. I know you’re an avid reader and I was wondering what YA books have influenced you. Man Kimberly, I could write a book about this. I keep rewriting my answer because I ramble on an on about this. People are warned against asking me about books I love because I never shut up once I get the chance to gush about books. One (out of about a billion) book that I think of is Empress of the World by Sara Ryan. In Empress of the World Nic goes to camp and becomes mesmerized by a girl named Battle. I wasn’t that young when I read it, but girls having feelings for other girls had always been a far off concept, something that barely even existed except on TV. That book opened my eyes to who I might be. It’s not like I read that book and stood on a table and decided I was bisexual–books can’t make you change your sexuality. It’s BS when people say that they can. Being bisexual was already part of me: I had wanted to marry girls, I had been obsessed with the girl with long black hair in my biology class, but I had never considered that it could mean anything until I read Empress of the World. And I would be remiss not to mention Fat Kid Rules the World. (We never would have met if we hadn’t both been facebook friends with the author, KL Going!) Fat Kid Rules the World has left an impression on my life that has grown since I first read it at 13. It made me want to write books in the first place, it keeps me from letting my insecurities eat me alive, it opened my eyes to drug addiction and my little worn out paperback copy is like my security blanket. Now I am cutting myself off from long explanations but some more books are: Get Well Soon by Julie Halpern, Upstate by Kalisha Buckanon and Chloe Doe by Suzanne Phillips. Now I am cutting myself off again because I could list hundreds! I love that you’re a book junkie!!! I also think it’s very brave of you to share something so personal. Everyone should be allowed to be and explore who they are. I am so happy a book made you feel comfortable. I have to agree-Fat Kid Rules the World and K.L. Going are favorites of mine and I love them even more for connecting us and allowing us to become friends. In a perfect world I would want to write YA novels as a career. I have gotten pretty far into writing a few novels, but the first two were horrible so I gave up. The third I have been going back to every once in a while, so I may finish it someday. I’m at a college with an excellent creative writing program and am so impatient to start the workshop classes. I started this with “in a perfect world” because I know that it may never happen. So my realistic dream is to be a librarian. I love libraries and books. One of the librarians at my local library has been trying to dissuade me from that dream–he is half joking but he is too persistent to be kidding 100%. I’d be studying and he’d come up to me and outline the boring tasks he had to do that day and I’d say “I’ll do it for you!” which just irritated him more. I want to be very clear about something with you. I also knew I wanted to be a writer and I KNEW it would never happen. Be a librarian because you love it AND be a writer too. So tricky question because you are such a supporter of YA literature–What are we doing wrong? What do we need to do better? I think there is this temptation to try to trick young readers into thinking the worlds is better, safer and more forgiving than it really is. Maybe not so much from the writers, more parents want their children to be reading something that makes them feel optimistic about the world. But the world is messed up. I’m an optimist and everyone hates me for it. I also know that everything gets wrapped up all pretty for you in this world and I hate it when books tell me that they do. YA books are hardly the only culprits of the Everything is Fine ending–Tale of Two Cities is practically a template for it. But I feel like it’s worse to do in YA Lit because people are already trying to force this idea of a just world onto us. And actually, for the most part YA books are doing a really fantastic job of doing this. A big book that comes to mind is Compromised by Heidi Ayarbe. It ended so perfectly because the ending was far from perfect for the characters. The books with the “Everything is Fine” endings stick out because the more YA books I read, the less I found. So really I’m not answering your questions. I’m saying KEEP GOING. Keep telling us the truth. Yay! Thanks for the pat on the back. I think that’s exactly the kind of motivation I need to write the story I need to tell. Ummm last question…I promise. We have “bonded” over a mutual love of Friday Night Lights. *grin* Why should people watch this show??? I love Friday Night Lights so much that when you posted that you started watching it, despite never having spoken before, I practically jumped every status about it. Friday Night Lights is the ultimate show. People think it’s a show about football, but it’s not. It’s a show about people. Football is just kind of what ties everyone together. It seems like most shows have heightened realities and neon characters, but Friday Night Lights isn’t like that. There is nothing artificial about this show. The acting is genuine, the characters are like real people. And watching Friday Night Lights may bring you great new friends! I can’t argue with that. Becky, thank you so much for being interviewed. I think you are an amazing person and I am so glad that we’ve become friends. You can click here to find out more about Becky’s perzine EVIL FLOWER. 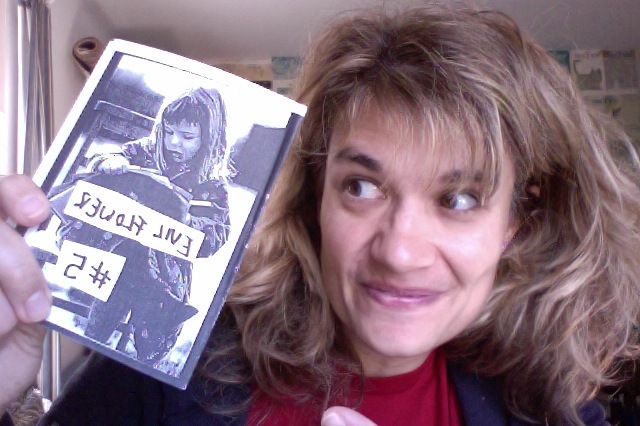 Or you can email Becky and find out how to get a copy of her perzine at inertiaendshere@gmail.com — I loved my first copy and I’m eagerly awaiting my next installment. 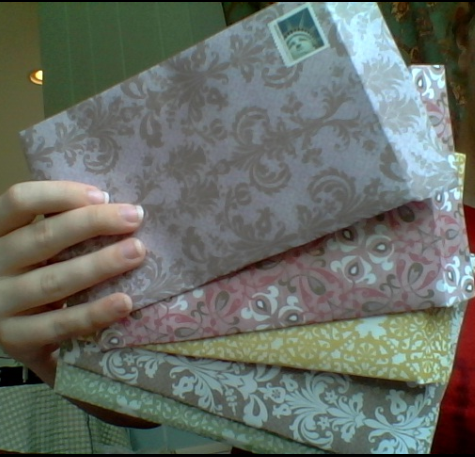 Especially because it comes in that gorgeous homemade envelope.